this photograph makes me smile. for a lot of reasons. its from a destination wedding that i second shot with meghan last summer. the morning of the wedding we split up…she went to photograph the men getting ready, and i stayed with the ladies. they were all making the days preparations and getting ready in their parents master bed & bathroom at the family lake house. it was beautiful, fun and sweet all at once. i was walking back into the bedroom photograph the jewelry and other heirlooms that would be a part of the brides’ attire that were carefully laid out on the bed, and i glanced to my left and saw this sitting on the dresser. 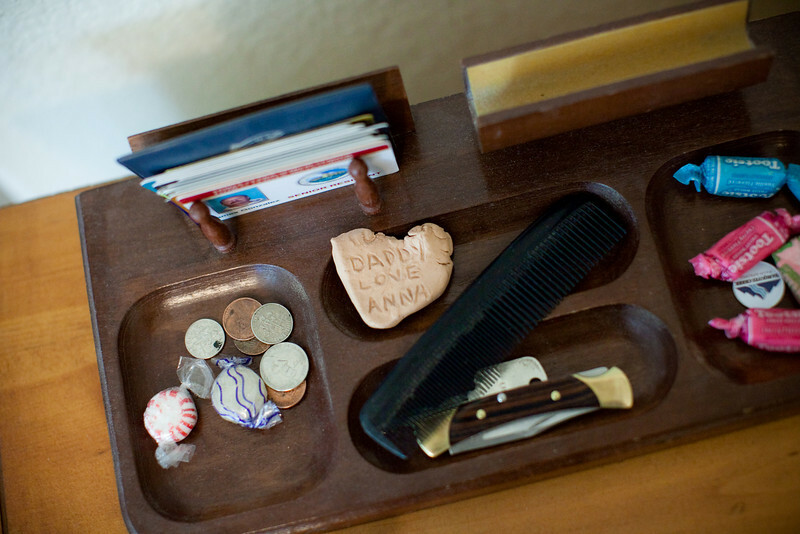 i’m not sure what i loved more…the black comb that reminded me so much of my own dad or the handmade clay treasure that was so quietly displayed and kept beside it. i was so happy that such a sweet token had caught my eye. because even though the bride-to-be had given that to her father long ago, it was there in the room with her as she put on her pretty white dress…almost listening in as she chattered excitedly with her bridesmaids. seeing it made it even more meaningful for me to be able to photograph this father & daughter duo and their walk down the aisle, which in turn it made this detail even more necessary to photograph. i think that details tell a bigger part of our story than we often let on. I am always amazed at your ability to notice details about the things around you and then so accurately attach meaning to them. I think it is that creative spark you’ve got, and the photographers eye. It makes you see beyond the ordinary object to how it has factored into someones real life, everyday or otherwise.